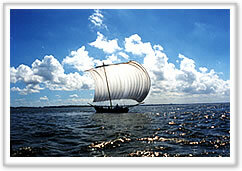 Lake Kasumigaura is Japan`s second largest and can be reached in less than 20 minutes by car from Tsukuba Center. A great way to get acquainted with this historically (and once culturally and economically) significant body of water, get on a motorboar,cruise ship, kayak, canoe or dragon-boat at the Lacus Marina Festival tomorrow January 10, 2016. If you are lucky you might be able to see one of these traditional HO-BIKI SEN fishing boats out on the water. Traditionally, the Japanese have always made a fresh start in EVERYTHING after New Year`s. In fact, this went so far, that in past ages all Japanese were considered to have aged together by one year after the first day of the first month of the year ( even a baby which had been born a week earlier!). The twin-peaks of Mt. 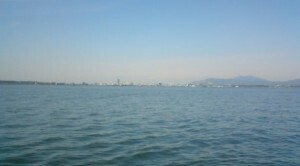 Tsukuba – nd the Tsuchiura sky-line, as seen from out on the lake. And though now there are INDIVIDUAL BIRTHDAYS ( though interestingly 20 year-olds still celebrate their coming-of age together as a group in January). as well as additional new beginnings such as the new SCHOOL YEAR and new FISCAL YEAR ( which start in April in Japan), all sorts of NEW BEGINNINGS are still commonly recognized and celebrated. There is the first sunrise of the year ( HATSU HINODE, 初日の出), on the morning of January first, the first CALLIGRAPHY of the year (KAKI ZOME, 書初め) on January second, and the first tea ceremony of the year- HATSU GAMA. There is also the first letter sent (HATSUDAYORI, 初便り), the first dream (HATSU YUME, 初夢), the first purchase (KAIZOME, 買初) and the first training session for your traditional martial art (KEIKO HAJIME, 稽古始). There are special expressions for FIRSTS OF THE YEAR of almost every kind. There is even a special term for ones the first sexual act of the year- HIME-HAJIME! 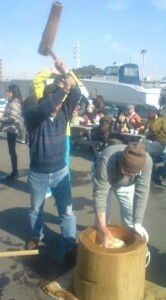 For the occassion rice will be pounded into MOCHI- rice cakes! One FIRST-OF-THE-YEAR EVENT which has become a tourist attraction throughout Japan is the DEZOME SHIKI (出初式)- the first coming- out- of- the- year of Japan`s firemen- which can often be as spectacular as a circus, with traditional acrobatics performed atop bamboo poles, exhibitions of firefighting techniques ( including fire-hose spray shows), and displays of new fire-trucks and equipment. Just about every city in Japan has a DEZOME, and as you can imagine they are especially attractive to families with small kids. Well last year, I wanted to go check out the fire-fighters festival in Tsuchiura, which I heard usually culminated in a spectacular fire-hose show down by the Yacht Harbour on Lake Kasumigaura ( just in front of Tsuchiura Stations East Entrance). I had looked at a web-site that I usually use to get information about traditional events in and around Tsukuba, and found that the DEZOME in Tsuchiura would be held that morning. We hurried down to Tsuchiura with great anticipation. When we got to where I thought the event would be held, however, instead of shiny fire engines and excited crowds we found only a few people lazilly fishing off the pier. Naturally we were disappointed, and I kicked myself in the pants for not having CONFIRMED the time and place by phone with Tsuchiura`s City office. It turns out we had arrived a day too late. But sometimes stupid mistakes can end in great discoveries. So while we had missed out on one FIRST-OF-THE-YEAR CEREMONY, we accidentally found ourselves at another one! Driving a few hundred meters further down the waterside, we came to a fenced off area within which all sorts of small and medium watercraft were PARKED on land. At the gate there was a sign which read something like: LACUS MARINA ハーバー開き　寒風大会　誰でも楽しもう- meaning The Lacus Marina`s Harbour Opening- the Cold Wind Festival- Anyone Can Come and Enjoy! Since fate seemed to have brought us to this place and also because the weather happened to be just perfect, we decided to take up the invitation offered on the sign and headed on into the marina. For a thousand yen per person ( 500 for children) we were offered freshly pounded rice cakes ( omochi), and lots of other food and drink which was laid out on tables outside, free rides on all sorts of water craft ( motorboats, canoes, kayaks, and sailboats), and most importantly for me a taste of what it was like in the old days when WATER TRANSPORT had been such a vital part of like in this and other parts of Japan. In this country,before the rise to dominance of railroads, and then later roads for automobiles, most goods were transported ( whenever possible) via waterways! In the Edo Period ( 1600-1868) , goods produced in the Tsuchiura area, most prominantly soy sauce, firewood, rice, and straw sacks, would be taken to Edo by wind driven boats called TAKASE BUNE (高瀬船). On the return trip these same ships would bring back salt, sake, textiles, etc. This trip would take take anywhere from 3 days to a couple of weeks ( depending on wind and other conditions), and took the craft from Lake Kasumigaura to the Tone River, and then to the Edo River, before reaching its final destination. 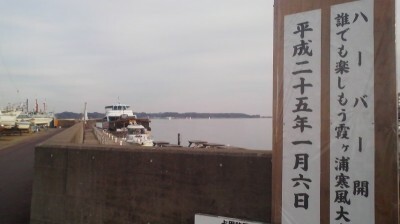 A different route would take the boats to the important seaport of Choshi (銚子), now in Chiba Perefecture, from where fresh salt-water fish and salt were brought to Tsuchiura. Besides the ships used for transport there were all the various types of fishing craft ( from the days before the lake was closed off from the sea and fish and shellfish still abounded) , and the house boats in which people lived on all year round. Also, after the fall of the Shogunate and the liberalization of travel, and before the completion of the Joban Railway Line, usual Tsuchiurans would travel to and from Tokyo by ship. Naturally, travel between the villages located around the lake was also done almost exclusively by boat. 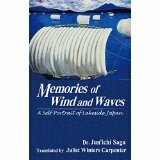 Almost all the boats on the lake remained those either powered by wind or oars until the Taisho Period (1912-1926) even though a few steam-powered ships were introduced as far back as 1891. 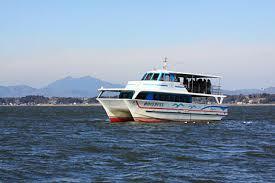 The Choshi Maru steam-liner could shuttle passengers between Choshi and Tsuchiura in 8 hours. 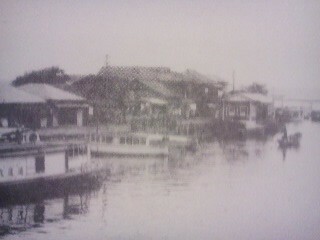 This vanished world, so centered around the lake and so full of boats, is evoked tenderly in Dr Junichi Saga`s book Memories and Silk and Straw ( a book which I strongly recommend to anyone living in the Tsukuba area), and images from the stories told in his book floated across my mind`s eye that morning as I sailed off out into the lake and watched the modern city of Tsuchiura fade away in the distance. All the watercraft teeming with people and goods, the lake itself teemiing with fish and shellfish, the streets packed shoppers and sailors, the hustle and bustle. All that lives on only in Saga Sensei`s books. Drifting peacefully on the lakes still waters with only a handful of other boats in sight, all recreational, really drove home the sense of MUJOー　（ 無常）, the fleeting nature of all things. The marina staff was extremely kind and they patiently helped out anyone who wanted to try out the canoes, kayaks or sailboats. If you would like to get a feel of what its like to get on the lake- these days will provide the perfect chance. 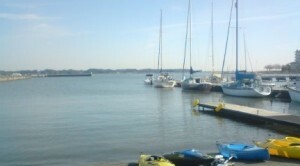 The marina itself is also interesting in itself, as it is used by various groups to store their boats- the Kasumigaura High School Yachting Club, for example, which has developed many of Japan`s Olympic sailors, trains there. 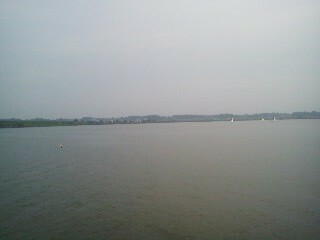 One very strange thing for me at the marina, was the rarity having a pleasant Lake Kasumigaura experience. It was nice to see so much bird-life freely enjoying the lake- since I have spent many hours freeing these same species from the nets which make the shores of Kasumigaura, at the villages of Okijuku and Tamura a veritable execution grounds for birds. 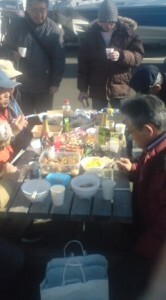 Is omochi nage a New Year event in Tsukuba? I’ve yet to see dezome. It must have drawn a large crowd every year. You are lucky to find Harbor-Biraki at Tsuchiura, nice review about water-root Edo-Tokyo until recently, I hope someone will think about cruise from Tsuchiura through Kasumigaura to Nihonbashi, even somewhere we should use bus or other transportation. It might be cruise for intelligent adults with knowledge and time. This time I read your very impressive article last August about Yokaren-and WWⅡ, it was not an simple articles of usual Americans but a deep analysis from the high view point of Historian of man kind. May be many American people did not accept your view about the use of Atomic bombs on Hiroshima and Nagasaki. The big changes have occurred in Asia after WWⅡ,from colonies to independent countries. As you suggested almost all young Japanese scarcely know Japanese History from Meiji-era to WWⅡ,luck of time? not knowing how to teach? So they should learn by themselves, I think NHK-Taiga Drama “Sakanoue No Kumo” is very important Drama for many Japanese. History can teach us many reasons of Historical occurrences, and to stimulate to consider for future. My teacher in primary school 4-6 grade was graduate of Yokaren may be around 28 years old , he was somehow rough like threw chalks to boys who was chatting, using Soroban to strike naughty one’s heads. Even so he was liked because he liked swimming, hiking, skiing and took pupil to such outdoor activities, he is around 80 now, so he can not attend class-meeting. We always hope his good health. There was Navy-Air-squadron training field in Yatabe-area, now there are National-Agricultural Institutes. Yokaren were trainee-students, Those who were trained in Yatabe were Real Pilots of “OUKA＝桜花”：a bonb stile aircraft go down from the big airplane. I remember there was high attitude photo taken from US-B29 just after the War, it was hang on the wall of Soya-shop near Arakawaoki station. 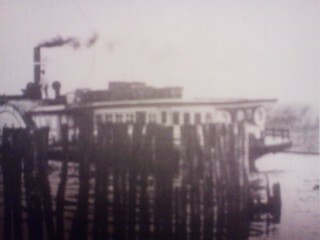 I would like to visit that Shop near future whether the photo is still there or not. Sorry, I was a bit late in wishing you a Happy New Year! All the best for this year, my friend!